The evening didn’t begin with much promise, as we were treated to about ten minutes of formless ethereal music before the show started. PWL The level of conversation grew louder during this time until I could hardly hear the music, which was all right with me. But then the lights dimmed and the audience fell silent as keyboard player Warren Bernhardt and guitarist Tab Laven took their positions. A follow spot swung toward the right side of the stage, the curtain drew back and the man himself walked out onto the stage, greeted by a crescendo of applause. Garfunkel did indeed look like a favorite uncle, his famous Afro diminished by a balding crown, the sleeves rolled up on his white shirt, and holding a piece of paper in his hand. 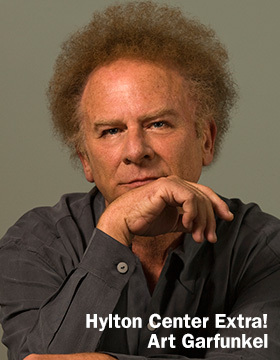 Garfunkel also talked about his famous walks. He first crossed Japan on foot in the early 1980s, and then walked across the U.S. incrementally between 1983 and 1997. In May 1998, he began an incremental walk across Europe, starting from Ireland and ending up in northern Greece. He went back to Ireland in early 2014 and reached Istanbul, Turkey in August of that year.